I love the Asian aesthetic and have painted many paintings with Asian inspired objects. Living on the west coast there is a lot of Asian influence and it's easy to find beautiful props in thrift shops or consignment stores. This was the first painting I did in my new studio inside my house, which I was still busy trying to figure out. I now have great lighting in the room, so I can easily paint at night time if I want to. The bulbs I purchased are Satco LED A19, 15.5W, and 5000K which provides full spectrum light. I can easily see the colours on my palette as well as on my canvas. Because I paint from life and try to have only one light source, I set up my still life in a black shadow box, with a spot light trained on the set up. I then taped some wide sheets of Aluminium foil attached to each other as one, from the ceiling, blocking the room lighting from hitting the still life set up. The shiny side is turned away from me, which is working, but I may change this to a dark fabric. I also have black out fabric curtains to avoid sunlight coming in when painting a still life, as I have a south facing studio. It's heaven to not have to set up and break down all the time, and to have all my reference books, magazines, props and painting materials all in one place!! What is the best thing in your studio that you're really happy with? Hi there. 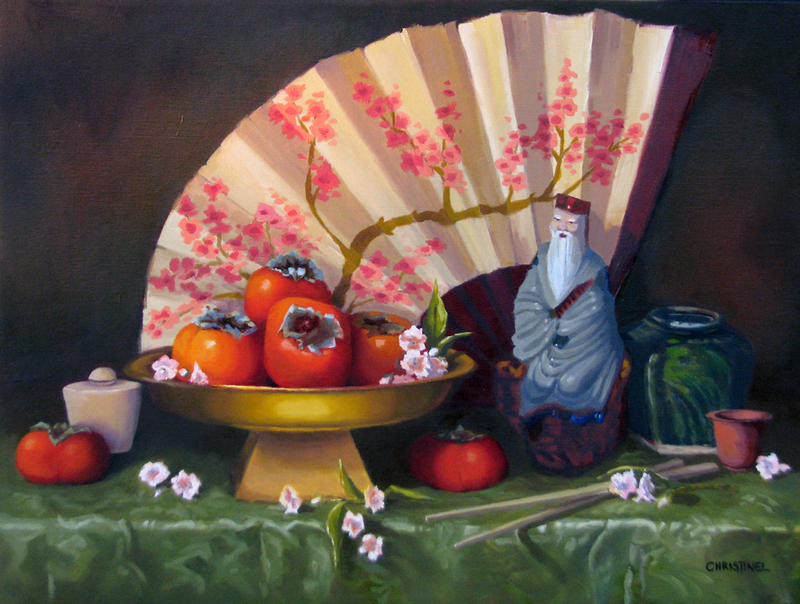 I'm a Still Life and Landscape Artist living in Victoria BC, Canada, situated on Vancouver Island. A Design graduate, I also studied Fine Arts in France and Victoria. I'm an award winning artist, and an Active Member of the Federation of Canadian Artists. I love painting, and the aim of this Blog is to document my journey as an painter. With each new painting I learn a lesson to hopefully add to my painting knowledge. The more I learn the more I realize that the learning is endless, which makes painting such a wonderful lifelong love. By painting small works frequently, I anticipate refining my painting style and skills to keep the learning fire burning, and I find that a really exciting prospect. Please feel free to comment and I hope you enjoy my posts.